Albert Camus: Born 100 years ago today. Awarded the 1957 Nobel Prize for Literature "for his important literary production, which with clear-sighted earnestness illuminates the problems of the human conscience in our times" the Bar None Group recognizes Albert Camus on the centennial of his birth. Primarily described as an existentialist — a label he never agreed with — Albert Camus gave rise to absurdism as philosophy and literature. The Plague, published as La Piste en français in 1947, emphasizes our lack of control in life and its inevitable irrational conclusion. Set in Oran, Algeria in the 1940s The Plague tells the story of medical workers — primarily Dr. Bernard Rieux — and the effects of a plague on its various characters while raising questions of our ultimate destiny. 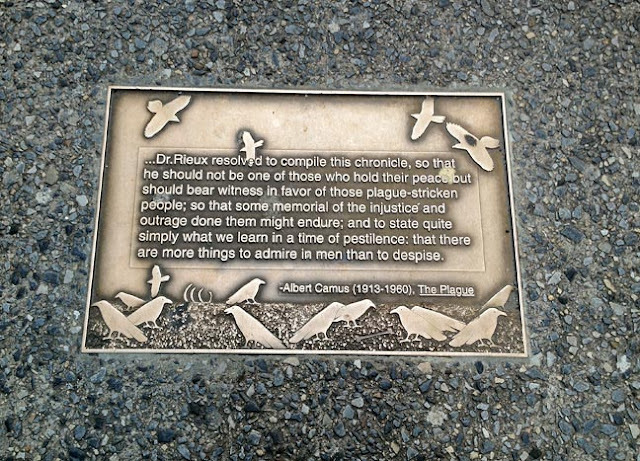 "...Dr. Rieux resolved to compile this chronicle, so that he should not be one of those who hold their peace but should bear witness in favor of those plague-stricken people; so that some memorial of the injustice and outrage done them might endure; and to state quite simply that we learn in a time of pestilence: that there are more things to admire in men than to despise." Camus is a virtual stranger in his native Algeria. The centennial of his birth will go unnannounced by the Algerian government as it harkens back to the days of French colonialism. Whether it be a birth day, anniversary or publication date of a seminal work, the Bar None Group will revisit these 40+ quotations from time to time — quotations that inspire one to write, read, explore and embrace literature. We last visited Dylan Thomas.